Our investment philosophy begins with understanding your financial goals and needs, not only in terms of returns, but also in terms of downside potential when corrections and crashes inevitably occur. Before discussing any recommendations and strategy, we invest the time and effort to understand your financial situation, your past investment experiences, and where you want to be in the future. We’ll discuss different investment scenarios to understand what are the limits and preferences for risk and return. We analyze their current portfolios, not only to see if they are well positioned from those scenarios, but also in light of the current market situation, cost control, tax efficiency and a host of other factors. We offer complimentary consultations whereby you can go through this discovery and analysis process, and take the time to experience our expertise without obligation, before making a decision. We have often been told that our care during the consultation was a key factor in many clients’ decision to come on board with us. Risks are not constant and are open to change, as managers we remain openminded to potential changes. Avoiding losses is a critical part of outperforming over the cycle. The price paid for investments is critical, and patience pays dividends. True risk management requires a move to cash at times. Investors and markets are behavioral – fear and greed are common and so is reversion to the mean. Fundamental Analysis – studying a company’s accounting metrics and applying valuation to find underpriced investment ideas. Technical Analysis – using various types of charts to determine patterns, trends and potential turn-around stocks. Behavioral Analysis – looking at different factors to identify out-of-favor investment ideas and market or sector extremes. 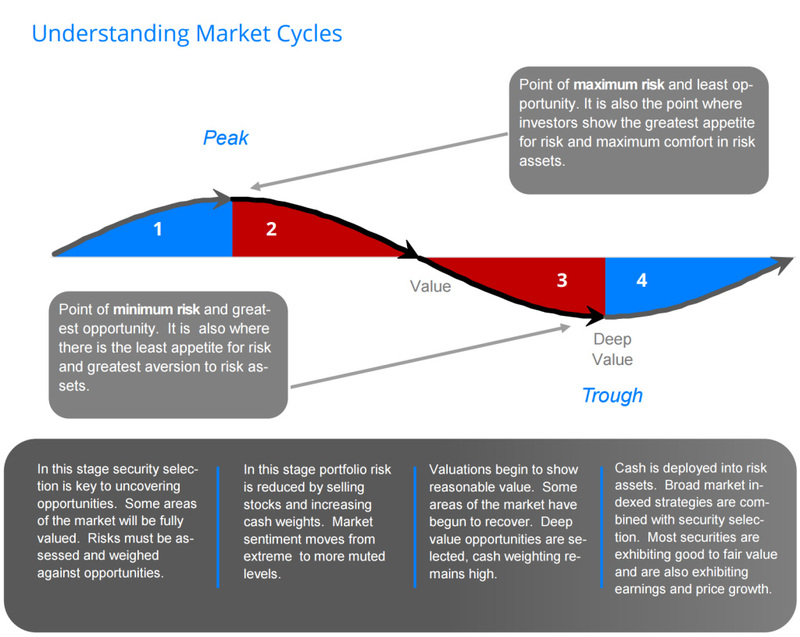 Intermarket Analysis – examining how different markets interact. For example how a change in the currency markets can affect gold prices. Despite the dot-com bubble of 2000 and the great recession of 2008, general ideas behind risk management have not changed much. We try to look at risk differently than the standard measures of volatility such as “standard deviation” and “beta” or deviations from a benchmark. We try to view risk as the possibility of losing money over a period of time, and actively measure downside deviation of our tactical strategy. Additionally, we may actively employ methods to move investor cash to the sidelines in the event of a market breakdown. Although the risk is present that we could miss out on market upside, our clients who choose this management style require the active preservation of capital to ensure their retirement plans remain on track. Evaluating research from several of the largest and well-known financial institutions and brokerages in the world. Evaluating domestic and international sources of research. Using data-feeds to build and maintain our own models. Consistently making an effort to find brokers who can offer you the best price or cheapest execution. We can build a position over time to take advantage of market fluctuation. We can increase or decrease the size of a position without extra commissions to our clients.